Not really what else we should say, other than : we’re still here. Greeting the non-happening of an earth-shattering event with the words of a song about about a talking train seems somewhat glib, but then again, what is the appropriate amount of non-glibness to exhibit? It’s interesting to note that we had a spike in traffic – and even a couple of comments – from the USA, presumably checking out some New Zealand websites to see if our half of the internet had suddenly gone down in a screaming heap of molten silicon and twisted telephone wires. As it happens, not a thing untoward, nada, zip, zilch, nothing. Life goes on. Relating to this last weekends hoohah about Armageddon, the thought just occured to me – that we could have a sign saying Welcome to the End of the World…. or equally, Last Place on Earth. Or even just Rapture! Hmmm…. we were joking, I think. It’s a nice one-liner, not to be taken that seriously. What is more interesting really, is that the Council has decided to authorise it without a publicly notified Resource Consent. This is strange – and smacks of subterfuge by someone – no, not by the mayor, as even she sounded surprised that it had gone ahead, but in Wellington’s hands-off manner, some minor Council minion has said yes. Now – given as signs normally have to get Resource Consent if they are larger than 2m high, or taller than 4 storeys up a building, that would seem strange. This sign is 3m high and well over 20m long, and spotlit at night… which you might think would have been better notified to the public. As it is, the decision to tuck it in under the radar of Wellington Airport seems to have been a shot in the foot. It’s a joke ! As an idea, we smiled, briefly laughed! But do we really need a built sign? 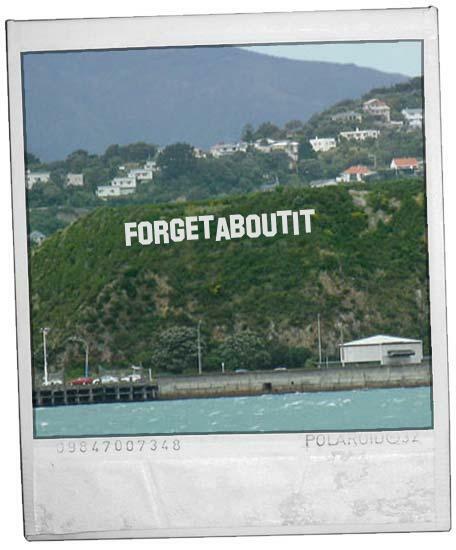 The head of Wellington Airport says that no one has come up with a better alternative to the sign. Actually, that’s not true. The better alternative to a sign is… not a sign. No sign. Did some Council Officer with a typically kiwi sense of humour deliberately set up the Aussie CO of WIAL? The airport company has an un-notified consent for a sign that is 12 times as large as is usually permissible but may face problems in proceeding with the intended sign. The Airport Precinct rules indicate that the hill shape has to be retained and earthworks are restricted which may present some difficulties in traversing the site and placing foundations. More significantly, it appears any hard lines (i.e. letter shapes) will need to be moderated with soft landscaping, suggesting the letters will need to be obscured by transplanted mature trees. I have to admit – at first I was 100% against the sign, but I’ve come around on it. after reports like this http://www.stuff.co.nz/dominion-post/arts-life/5023957/Can-Wellington-retain-its-arts-capital-title that predict the death of the arts as a integral part of our city culture, I can think of nothing better than this sign as a tombstone to originality and creativity in the city. How would the size be a problem considering the huge Hyundai billboard on the same property? I’ve seen at least 3 differing dimensions for the Wellywood sign so if it does get built it will be interesting to compare the finished product with the photo held by the airport ceo. Actually the proPosed sign doesn’t really worry me either way. Of course, the only place you won’t be able to see it, is from the airport…. Anyway – I’m sure that Wellingtonians will Absolutely Positively Creatively Decoratively give it welcome treatment with paintball guns etc. I can feel a challenge coming on….